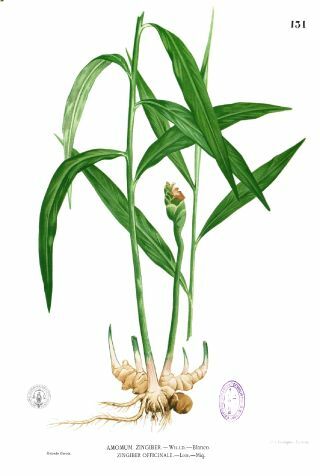 Genuine ginger is a curative plant that equates to classical adaptogenes with the strength of its effects. The fact that ginger is not a miracle as a miraculous plant is probably because we know it better as a "simple" spice - something that is due to its taste. We should get used to this spice to look like a miracle cure and the whole family of gingerbread ( Zingiberace ) as a family of miraculous plants. Ginger is full of effective phytochemicals. The sharp ginger taste is caused by ginger, for the taste of dried ginger used in gingerbread cookies, there are also chocolates that are formed from gingerolles by dehydration. Gingerols are blessed in ginger and have extensive healing effects ( Semwal2015gsi ). I did not study phytochemistry in detail, but I know that Dr. Duke's database considers ginger to be the second highest in the ranking of antiviral substances (the first is a leaf of blueberries ). Ginger and chocolate have their own antioxidant, bactericidal, anti-inflammatory and anti-allergic properties. Ginger is, in my opinion, a valuable addition to treating diabetes , heart disease and liver disease , not to mention cancer ( Semwal2015gsi ). Ginger acts against inflammation and pain ( Lakhan2015zep , Hoseinzadeh2015aeg ). It was therefore quite logical to pay attention to its use in sport ( Wilson2015gzo ). It also has specific anti -arthritic effects ( Grzanna2005ghm ), its knee pain effect ( Tapsell2006hbh ) is clinically proven. Ginger is part of TČM mixtures for headaches and migraines . Young, fresh ginger can be easily found in Central Europe. This miraculous cure, cut into thin, long noodles, I chose as one of the ingredients necessary for successful bluffing that you can cook Chinese cuisine . Its curative properties, for example, with passion or liver, vegetarians will appreciate the combination of grated yogurt and avocado, gingerbread, smoked tofu fries and thick soy sauce not to mention. Miraculous tea is also prepared from ginger.